Back in the early 1990’s, Lady Tiger Electronics (now owned by Hasbro) created a non-working prop for the movie, Home Alone 2. After a massive letter writing campaign (we’re still in the days before email) prompted the company to turn the Talkboy into a retail venture. The device was made up of a handheld cassette recorder, which would record, play back and manipulate speed as well as alternate the user’s voice. Talkgirl, like Eve was created after her Adam counterpart by the company Team Machina. If you dig into your parent’s closet and find a copy of Poison’s Look What the Cat Dragged In, picking up a Talk girl to play it on is akin to peanut butter and jelly. It just tastes good. Plus any pastel outfit can be easily coordinated with this handy accessory. Let’s just say if Sonny Crockett had a daughter (which he did in the show) she would be playing “In the Air Tonight” on her Talkgirl. I’m sure there’s an app on the iphone that can manipulate voices and shoot off laser beams into outer space. But that doesn’t compare to whirlwind, hypnotic rhythm of a tape spinning around and around – until, of course, it jams. 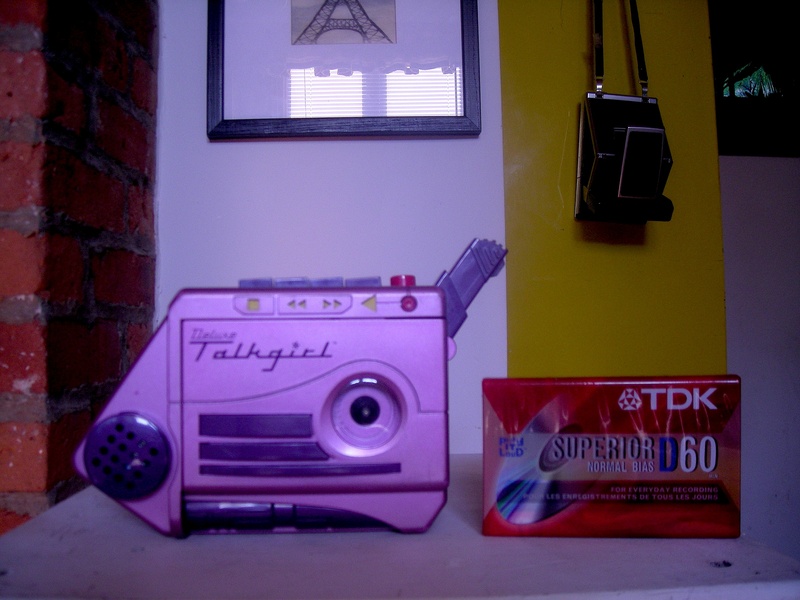 The Talkgirl will be available at the Disco Tag Sale along with these other items. This entry was posted in Uncategorized and tagged Disco Tag Sale, Home Alone 2, Miami Vice, Poison Look What the Cat Dragged In, Sonny Crockett, TalkBoy, TalkGirl. Bookmark the permalink. 1 Response to Hey TalkGirl! (now owned by Hasbro) You’re so Funny!